Blank Page Muse: Background Grunge Collaged Postcards - Quick Ideas! Background Grunge Collaged Postcards - Quick Ideas! Today I am sharing two quick postcards using some of the "extra" ink sprayed and stamped tissue paper I made for my post earlier this month! I always try to make extra backgrounds when I have everything out so I have a "stash" if I need to create quickly! For these 6 x 4 cards I used tissue and deli paper stamped with designs from the "Background Grunge" Stamp Set - I love the range of designs in this set! 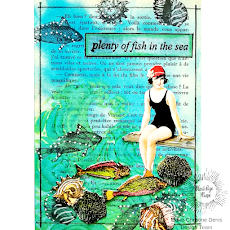 Easy to decorate - just cover your card with the background paper - trim excess and add some quirky collage elements - I've used collage sheets by Art Tea Life for these cards - plus I added some sticky mesh for a little bit of texture. I've also edged the sides of the cards with the same colour ink I used to stamp the backgrounds. Happy Stamping with Sin City! !